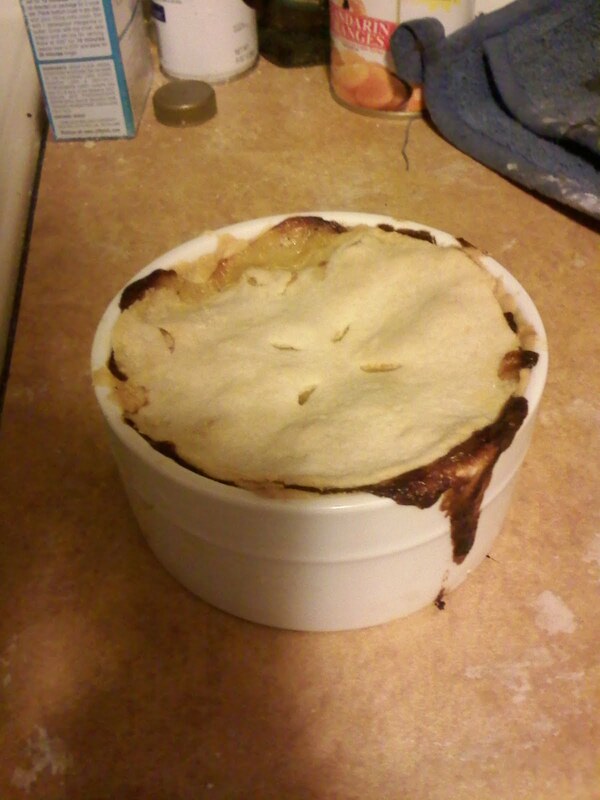 So the other day, Lily and I made chicken pot pies in order to test a recipe for our christmas gifting. The recipe was one we tweaked to make a little easier and I took a shortcut on the crust in order to not have to take so much time making them for the trial. I almost like the crust enough to use it for the real gifts! It was Jiffy Pie Crust in a box, and it was flaky and delicious! For 50 cents a box, you really can't go wrong! The recipe came out pretty good, though I know for the real ones, we need to use more cream of chicken soup. The crust more or less sucked up all of the extra juice and there wasn't really any gravy running in the middle, and if you ask me, that's the best part! Prepare crust. Divide. Line greased ramikens with half of pie crust- just press it in using your fingers for the insides. Roll out remaining crust and use ramikens as a guide to cut a circle. Set aside for topping. Cook cubed chicken in a small amount of olive oil. When cooked, add cream of chicken soup, milk, and vegetables. Salt and Pepper to taste. Spoon into ramikens, top with circle of crust. Seal crust around edges and cut a few holes to vent. Bake per crust package directions or until crust is golden brown.